Haq's Musings: "Starving" North Korea's Space Pursuit Different From Hungry India's? "Starving" North Korea's Space Pursuit Different From Hungry India's? While India ranks at 65 among 79 nations ranked by the International Food Policy Research Institute on its hunger index, North Koreans are considerably ahead at 52 and Pakistanis at 57. The World Hunger data shows that India, which gets a free pass from the western media and active support of western and Russian governments to pursue its nuclear and space programs, is doing a poorer job of feeding its people than the North Koreans. Is this not hypocrisy to cite North Korean hunger as a reason to criticize its space program while lavishing praise on India whose citizens fare worse than North Korean citizens? Can India "Do a Lebanon" in Pakistan? Consider the fact that India spends on the upliftment of its citizens, has acquired the means to sort out all these problems. Plus this index has been assembled using data which is a few years old. Plus India is very vast democratic country and governance is much more difficult than small countries like pak and north korea. If hunger is your only priority and nothing else, I'd suggest you stop educating anyone in pak, which anyways your government is slowly doing and stop spending on research. Spend all that money on feeding pakis as they have not fared much better being a smaller country. North korea doesn't have the where-with-all to spend such sums of money as its economy similar to paks has stalled. It is heavily aided by china as pak is aided by the whole world. India on the other hand is making progress economically and hence can afford to spend on space experiments along with welfare spending, India spend as a % more than twice that of pak on education. Plus as a nation, we cannot be bogged down by a single problem and hence not move forward in other areas. The fact of the matter is India has been very successful in its space technology something pakistan doesn't have a patch off and still pakistan is worse of than India and is getting worse while India is striving hard and acheiving! 4) The fact of the matter is India has been very successful in its space technology something pakistan doesn't have a patch off and still pakistan is worse of than India and is getting worse while India is striving hard and acheiving! This idiot and his protege Fareed Zakaria have done most damage to the image of Pakistan. Anon: "Thomas Friedman, the paid agent of India mouths... his protege Fareed Zakaria have done most damage to the image of Pakistan." The work of Friedman and Zakaria clearly shows that they are dishonest partisan advocates. It's impossible for them to be objective. Friedman was a cheerleader for the disastrous war in Iraq and Zakaria is a cheerleader for India---calling it a "powerful package" and claims it has been peaceful, stable, and prosperous" in his book "The Post-American World". ^^RH: "The work of Friedman and Zakaria clearly shows that they are dishonest partisan advocates. It's impossible for them to be objective." What about Larry Diamond in that NY Times Article? Do you consider him to be objective? HWJ: "What about Larry Diamond in that NY Times Article? Do you consider him to be objective?" The problem with many of these western analysts is that they buy into the tokens of secularism and democracy in India without ay real understanding of how communal and undemocratic the Indian society is. People who know better are Bhimrao Amberdkar (“Democracy in India is only a top dressing on an Indian soil, which is essentially undemocratic") and Justice Katju ("90% of Indians are communal") and Justice Scachar who found that Indian Muslims are now worse off than dalits. They also don't understand how secular Jinnah was in his personal life and what his vision for Pakistan was...a fact that turned the vast majority of Muslim religious leaders in India against Jinnah and Muslim League. Are you claiming only those who bash India and/or praise Pakistan are non partisan. By that yardstick you yourself are the most partisan person because all you do is to exaggerate Pakistan's small achievements and run down India's achievement. FYI, there are many eminent Pakistanis who criticize pakistan for the same reason likeTF or FZ . You label them as disgruntled. How convenient. Pakistan's constant ethnic strife, mass scale killings of minorities is the reason for such a negative opinion of Pakistan in the western media. And don't get me started on Pak's role in terrorism, right from 9/11 to Abbotabad. That is a whole together different story and a major contributor to even more negative opinion of Pakistan. To the anon poster who claims TF and FZ have done most damage, yes, they did. They did more damage than killers of Shias, Ahmediyas, Balochs on almost daily basis. Or Malala case. Happy ? No problem can be solved without acknowledging the root cause. Pakistanis lament that the county has changed so much since 60s and 70s. Yes indeed. Why? Because there was no religious nonsense at that time. Learn from your best friend China on how to treat religion in public sphere. ^^@ Ramesh "No problem can be solved without acknowledging the root cause." The Root Cause is Kashmir. 1. The Muslims have no interest in politics as such. Their predominant interest is in religion ... Muslim politics is essentially clerical and recognizes only one difference, namely, that existing between Hindus and Muslims. None of the secular categories of life have any place in the politics of the Muslim community and if they do find a place - and they must because they are irrepressible - they are subordinated to one and the only one governing principle of the Muslim political universe, namely, religion. 2. "The existence of these evils among the Muslims is distressing enough. But far more distressing is the fact that there is no organised movement of social reforms among the Musalmans of India on a scale sufficient to bring about their eradication ... The Hindus have their social evils ... and a few of them are actively agitating for their removal. The Muslims on the other hand, do not realise that they are evils and consequently do not agitate for their removal. Indeed, they oppose any change in the existing practices." Did you read that, Riaz? The same Ambedkar you love to quote so often, felt that Islam is fundamentally incompatible with civilization? Bharat: "Muslim politics is essentially clerical and recognizes only one difference, namely, that existing between Hindus and Muslims." This statement is absolutely ridiculous when you look at the fact that Jinnah, whom Muslims call "The Great Leader" or Quaid-e-Azam, was no cleric. He was not even religious. In fact, the vast majority of the Muslim clerics (ulema) opposed Jinnah and supported Indian National Congress. Maulana Husain Ahmed Madani, the head of Deoband Madrassa and the leader of Jamiat Ulema Hind opposed Jinnah and opposed the creation of Pakistan. Having worked hard but unsuccessfully for Hindu-Muslim cooperation and unity, the Quaid--i-Azam was disillusioned with the Indian National Congress. He decided to join the Muslim League in 1935. After joining the Muslim League, his goal was to create a separate, independent homeland for Muslims of the Indian Sub-continent, where they could flourish freely without interference from or competition with the politically, educationally and economically dominant Hindu majority in South Asia. But he clearly opposed a "theocratic state" ruled by the religious elite (something like Iran's Guardian Council) with the ultimate veto power over the will of the people and the democratic processes and institutions. In fact, he believed in the separation of church and state, just as much as he favored the superiority of political leadership over the military officer corps in running the nation's affairs. “Never forget that you are the servants of the state. You do not make policy. It is we, the people’s representatives, who decide how the country is to be run. Your job is to only obey the decisions of your civilian masters.” Quaid-i-Azam's Address to Military Staff College, June 14, 1948. Riaz, what Bharat had quoted was merely what Ambedkar said with regards to his perception of the Muslim community. You cannot justify your views by selectively quoting a person's comment on that matter, while rejecting his views on other matters. It just doesn't hold water. Either Ambedkar is equally right on his perceptions of both Hindu and Muslim communities, or he is equally wrong. And by the way, don't you feel it being a lot awkward that you have to hold on to Jinnah's one speech in the Constituent Assembly way back in 1947 to show that Pakistan is pluralistic, as if there is nothing else to show as proof? If India merely had a Muslim President/VP and a Sikh PM (remote controlled by a Roman Catholic lady), we could argue that it is just hollow window dressing. But to have Sikh Chief of Army, Muslim head of IB and Christian Chief of Air Force speaks more about the triumph of merit and non-discrimination than anything else. Vineeth: "Either Ambedkar is equally right on his perceptions of both Hindu and Muslim communities, or he is equally wrong." I strongly disagree. Nobody's right about everything. Especially when there's evidence to the contrary. 1. Extreme right-wing religious parties, the equivalent of the Hindutva crowd which rules many Indian states, have never won votes more than single digit percentages in Pakistan. 2. NO amount of tokenism can erase the harsh realities Muslims face in India which were laid bare by the Sachar Commission. 3. Many Indian Muslims are essentially resigned to their third class status in India, and they accept various explanations offered by Hindtva types which essentially blame the victims. This is a sad situation. But it's not a new phenomenon. We saw it in Jim Crow South in the US, in the Apartheid state of South Africa, and in Palestine. "..The novelist Shashi Tharoor tried to burnish this certifiably sectarian phenomenon with a facile analogy: Indian Muslims, he wrote, accept Hindu rituals at state ceremonies in the same spirit as teetotallers accept champagne in western celebrations. This self-affirming explanation is characteristic of someone who belongs to the majority community. Muslims I interviewed took a different view, but understandably, they were unwilling to protest for the fear of being labelled as "angry Muslims" in a country famous for its tolerant Hindus." ^^RH: "Nobody's right about everything. Especially when there's evidence to the contrary." This is not always correct. There is at least one person who is ALWAYS correct, REGARDLESS of the evidence to the contrary. Riaz Haq said: "....Is this not hypocrisy to cite North Korean hunger as a reason to criticize its space program while lavishing praise on India whose citizens fare worse than North Korean citizens?" If North Korea had pure veg "murgis" floating around in the West it would get a favorable press! Mr haq , Are you gonna mention another fact from the same report that the percentage of population undernourished is 23% for Pakistan and 22% for India? ^^RH: "Justice Katju ("90% of Indians are communal")"
90% of Indians are idiots. Katju said: "80% of Hindus are communal, 80% of Muslims are communal and 90% of Indians are idiots. Addressing a seminar here, Katju had said that the only solution to the Kashmir problem is REUNIFICATION of India and Pakistan under a strong and “modern-minded” government which will not tolerate bigotry. I did some research on North Korea's satellite launch. It appears to be a simple one that merely used an augmented version of its MRBM-base to launch a 100kg (0.1 ton) satellite. This raises and interesting question: If we already have indigenous missles with a 2,500 km range and are now developing an indigenous ICBM (Taimur), why have WE not been able to launch our own small satellites? What does North Korea (a country poorer than ours) know that we don't know? Am I missing something? What are your insights? HWJ: "If we already have indigenous missles with a 2,500 km range and are now developing an indigenous ICBM (Taimur), why have WE not been able to launch our own small satellites? What does North Korea (a country poorer than ours) know that we don't know?" Pakistanis have a habit of surprising the world. NESCOM doesn't pre-announce anything before launches. ^^RH: "A sign of Indian Muslims' resignation was explained by Kapil Komireddy in the Guardian as follows..."
"...Indian Prime Minister Indira Gandhi stood before the Indian parliament and, amid a thunderous ovation, stated that India had 'avenged several centuries of Hindu humiliation at the hands of Muslim emperors and sultans'." But her official statement before the Indian parliament made no mention of religion at all. It could not have. None of the men who were leading India's forces at the time were Hindu. India's air marshal was a Muslim (Idris Latif); the commander of its ground forces in Bangladesh was a Sikh (JS Aurora); the chief of the armed forces was a Parsi (Sam Manekshaw); and the strategist who planned the capture of Dhaka was Jewish (JFR Jacob). India in 1971 was still an unimpeachably secular state. So why does Feroz Khan attribute this line to Indira Gandhi? It's because projecting India as a Hindu state is essential to Pakistan's sense of itself as the authentic home of the subcontinent's Muslims. And yet, after losing half of its territory and a majority of its citizens, what was Pakistan? And after killing so many Muslims, what moral right did it retain to speak for the Muslims of Kashmir? These are questions that do not occur to Khan, whose own world view was forged in the battlefields of that war. Bhutto's subsequent pledge to wage a "thousand-year war with India" is based on the idea of an eternal conflict and on the assertion that Muslims and Hindus are two separate nations. Jinnah had invented the myth of Hindu-Muslim enmity and offered up Pakistan as the sole answer to it. This myth collapsed in 1971. But in what remained of Pakistan the events of 1971 only provoked a renewed determination to defend that failed idea. Bhutto, even though he did not win an election, became the nation's leader." HWJ: "Read more from KAPIL KOMIREADY: http://alturl.com/wdze6"
Such self-serving reviews of things Pakistan by Indian commentators are not surprising. They are meant to sustain the Indian narrative of demonization of Pakistan. Brig Feroz Khan's book is a scholarly work that offers the first authentic account of the making of Pakistani bomb. I realize that you intended to compare India to North Korea using the table you provided, but did you notice something ELSE about the data in that table? 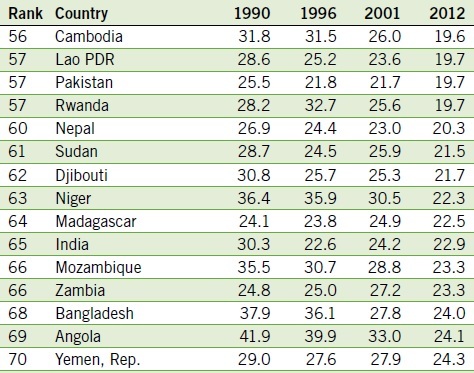 Clearly, Bangladesh has done the best job is REDUCING the extant of hunger. India has obviously not done as well as Bangladesh. 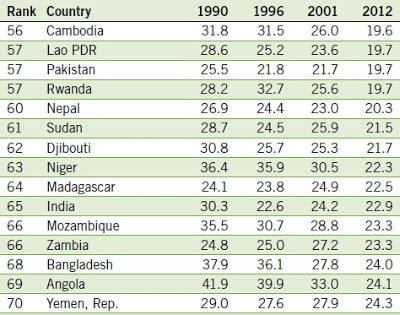 Our country, however, shows the LEAST IMPROVEMENT in our Hunger Index Scores over the last 20 years. This is not a good sign. As you can see, Hungry-India and Basketcase-Bangladesh are rapidly catching up with us as they narrow our historical lead. If we continue with this PPP stagnation, both of them will show better numbers than ours in next 8-10 years. Are Muslims Worse Off in Jinnah's Pakistan?